International Women’s Day is celebrated every year on the 8th of March. This day not only celebrates the global social, political and economic achievements by women, but is also meant to create awareness for the struggles of women worldwide and the fact that we still not live in a world with true gender equality. For instance, the street art scene is still considered to be mainly male dominated, but you’ll be surprised to find out that lots of the extraordinary art you see in the streets are in fact made my female artists, even the dark and grim works. 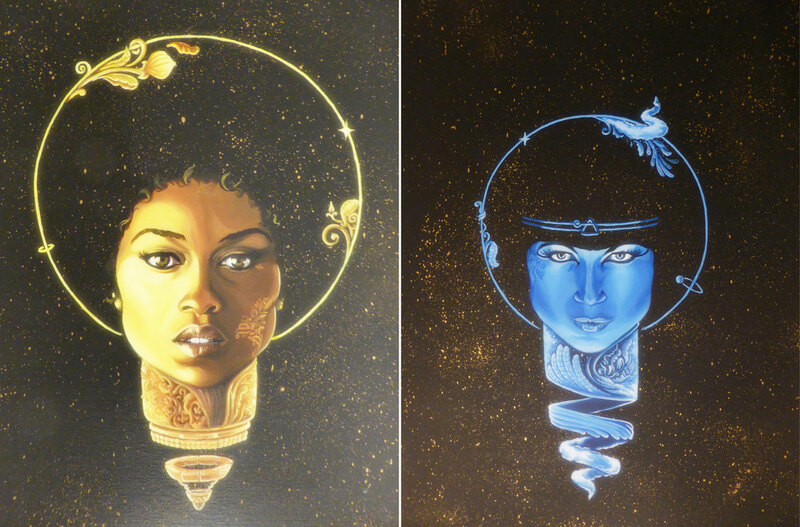 This year Ayaan Bulale (Street Art Agency), Darren Springer and Julian Aggrey (Cre8 Gallery/Earthtone Arts) organised a week of special events celebrating women in general and women in the street art scene in specific, under the name of Femme Fierce. 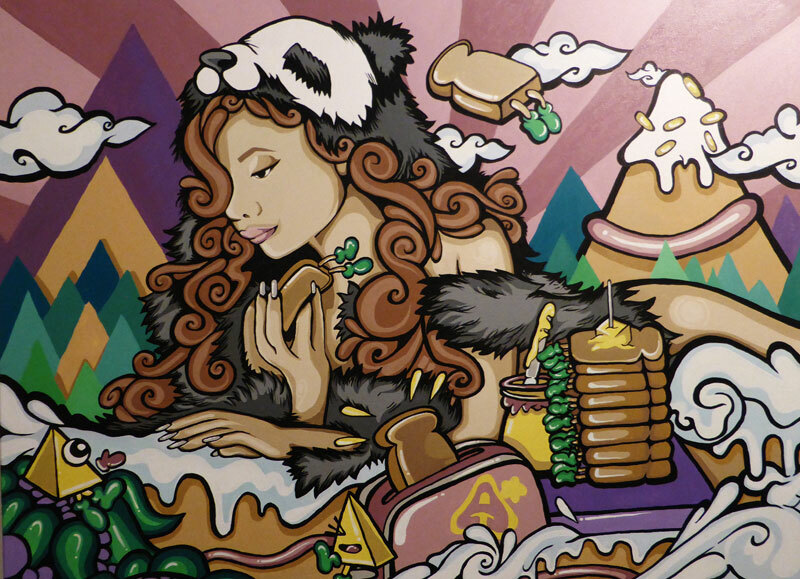 Femme Fierce started off with a bang on Friday the 7th of March with the opening of an all-female group show at Cre8 Gallery, showing works by Amara por Dios, Ashes57, Artista, Boxhead, Girls on Top Crew, Thieu and Zina. I posted a few photos of the show below, just as a small taster. I recommend you to go to see the show for yourself (works are for sale!). 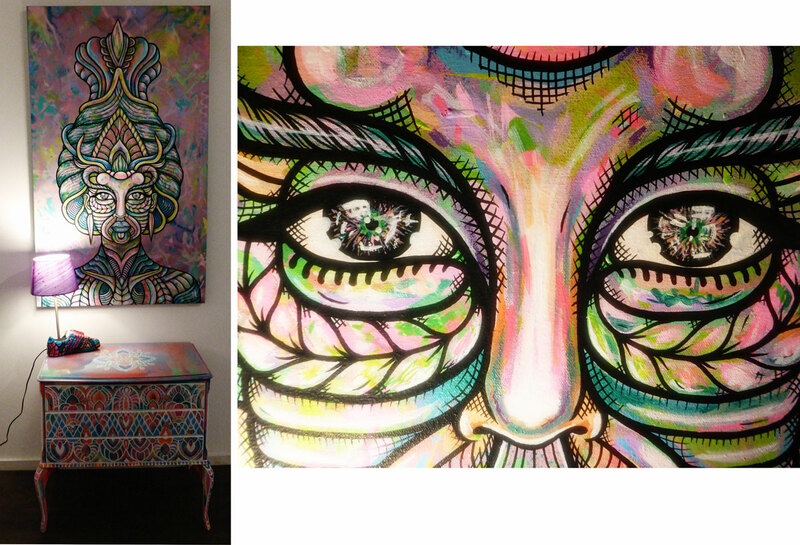 On the left a painting, chest of drawers and a sneaker lamp painted by Amara por Dios. On the right a detail of the painting. Work by Artista, featuring her signature ‘A’ and toast figures. Work by Ashes57. In the left bottom corner a reference to Shepard Fairey’s famous OBEY icon (she was an intern for Fairey). Me, myself and I by G.O.T. (Girls on Top Crew). Two portraits by Zina. Fantastic details in these works when admired in real life! The following day, International Women’s Day, was THE BIG day for the Femme Fierce weeklong celebrations. The day was appropriately dubbed Femme Fierce Extravaganza as over 100 female graffiti writers from all over the world literally painted the street pink that day. The artists took over the Leake Street tunnel’s legal graffiti wall to raise money for Breast Cancer Care, celebrate womanhood in addition to make an attempt to set the Guinness World Record for the largest spray paint mural by multiple artists. The day started off bright and early and PINK as the female artists first painted the tunnel pink for the mural background colour. I arrived at the tunnel in the afternoon and was pleased to see that the tunnel was already filled with magnificent artwork, intoxicating spray paint fumes, enthusiast artists and an amazing crowd of spectators including press from all over the world. Many people commented on the typical spraying sound (hisssss hissss) as you can imagine with over 100 artists at work simultaneously, but what I remember most is the sound of the constant shaking of spray cans and hearing the small ball inside it shake around against the metal (there is a small ball inside an aerosol can which mixes the paint when you shake the can). The sight was extraordinary: artists adding their own voice in the Femme Fierce mix while wearing serious masks to protect them from the fumes and while listening to their favourite music on headphones or chatting with admirers and posing for the photographers. Ayaan, one of the organisers, told me a few days later that she was so nervous beforehand and worried that no-one would respond to her call for artists and the tunnel would be empty on the day itself. Her restless nights were for nothing though as Femme Fierce Extravaganza was a massive success. Not only did they manage to create awareness for Breast Cancer Care and female graffiti artists, but the artists also managed to set the Guinness World Record! The group mural was actually over twice the size required for the new record. Congratulations to all artists, the organisers and everybody who was involved in this most successful event which was a creative and inspiring day. Everybody was so positive and friendly, even though the artists were exhausted after such a long day of painting. One of the participants actually told me she had never painted before and hadn’t anticipated to pick up a spray can herself that day. She was in fact responsible for some of the supplies, but got so inspired that she decided to be part of the group mural as well. This perfectly illustrates the mood of the day: open-minded, inspiring and fun. With this enormous amount of international exposure, I’m certain that this event has put London street art on the international map, but most importantly: it has put female artists in the picture. I got a bit carried away snapping pics, but there were just too many beautiful works being created right under my nose. There are too many photos to post here, so I will give you a selection of my favourite pics and encourage you to head over to my Femme Fierce photo set on Flickr for more and bigger photos. 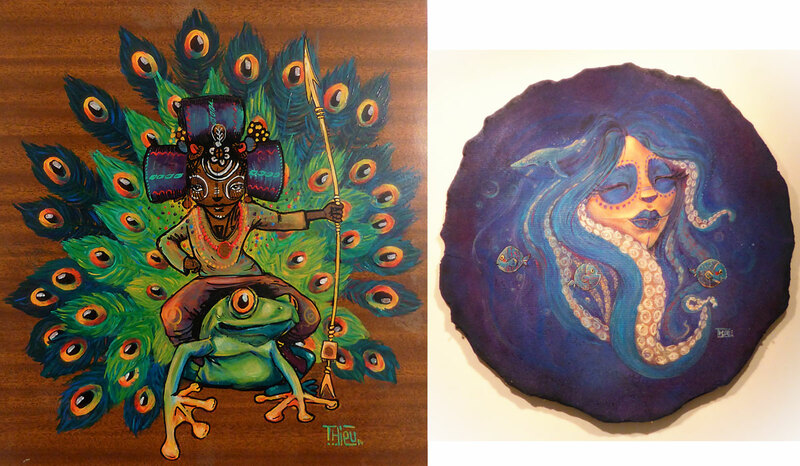 Amara por Dios work in progress (on the right a floor detail of that piece). Anna Rewinska creating her bunny puppet on strings which looked great! I also enjoyed watching artists using paint and brushes for the mural as I had never seen that done live before. Ashes57 at work. When Dr Cream and I asked her to contribute to the book, she apologised and admitted that her fingers were all cramped up from spraying and painting for hours. While she loosened up her fingers, we had the chance to ask her about the meaning of the numbers 57 (in her name) and 81 which often re-occurs in her works. She explained that 57 is the area code in France where she was born. 81 stands for the record label she is connected to as an art designer, Swamp81. Boxhead poses in front of her work, fresh on the wall (works by Thieu on the left and Ashes57 on the right). Roo at work. Her cute and larger than life work of a cartoon-style girl was chosen as the winner by the team of judges. On the left you see Cilla at work and her sketches are on the right. Beautiful dreamy work by Hannah Adamaszek featuring her famous native American power woman. I was really drawn by this abstract piece by Nemi Nem, most of all because she also included the floor as her canvas. Femme Fierce Extravaganza was truly a day of collaborations, friendship and family as Shirley Fallconi and her children/assistants prove here. The Femme Fierce weekend continued on Sunday with a graffiti workshop and the world premiere of Danish film maker Catherine Cort-Koppel’s documentary on women street artists: Women on Walls. In case you missed this screening (just like me), then don’t despair. There are plans for a second London screening in April. Follow Women on Walls on Twitter to keep updated. Sadly, all fun things must come to an end and so Friday the 14th of March marked the end of the creative and fun week. 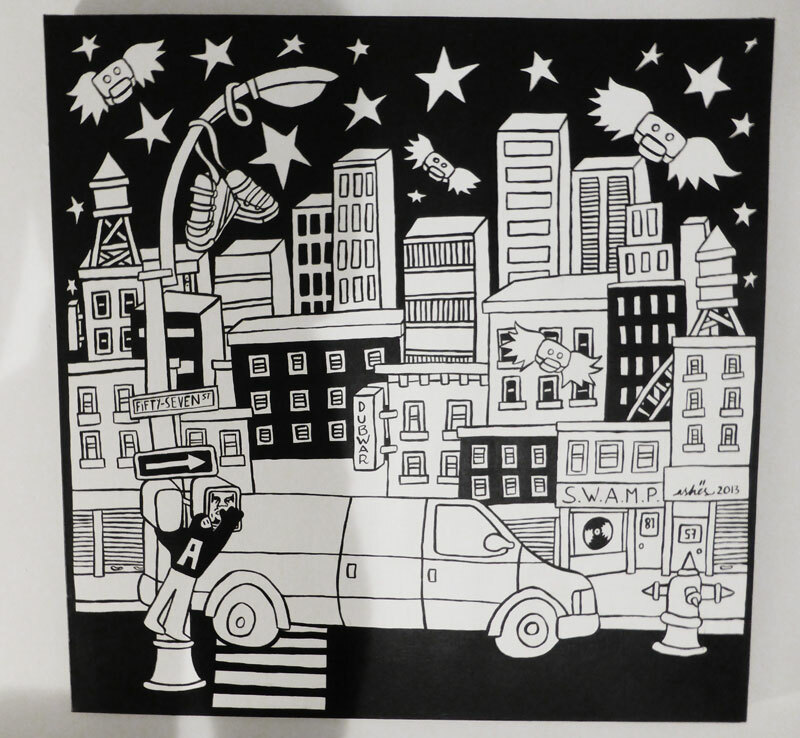 Highlights that evening were the live group mural painting by Amara por Dios, Boxhead and Thieu and the impressive live show by female rap trio LC Collective. They have their album launch at The Jazz Cafe in Camden (London) on Thursday the 22nd of May. Try to go there if you get the chance! Here is the ticket link (Ticketmaster). LC Collective performing at the Femme Fierce closing party (on the left is Joyce Treasure, one of the female street artists and in the background a work by Ashes57). 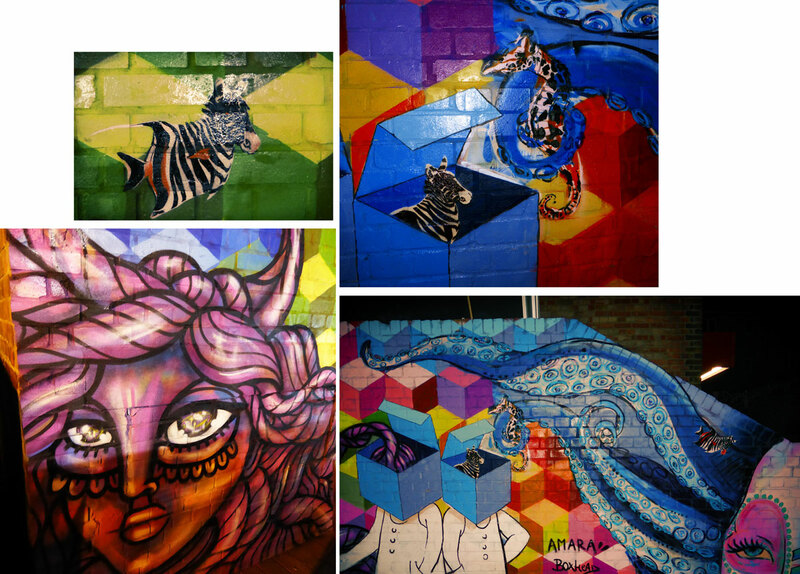 The group mural by Amara por Dios, Boxhead and Thieu made on the Cre8 Gallery wall on the Femme Fierce closing night. Details from the group mural. Two top photos are creatures by Thieu, placed in boxes by Boxhead. Bottom right: Thieu and Boxhead and bottom left: Amara por Dios. Posted in street art and tagged Amara por Dios, Artista, Ashes57, Boxhead, breast cancer, Cre8 Gallery, Extravaganza, female, Femme Fierce, Girls on Top Crew, graffiti, Guiness World Records, International Women's Day, Leake Street, London, mural, pink, Southbank, street art, Street Art Agency, tunnel, urban art, Women on Walls, Zina. Bookmark the permalink.